I’ve completed the mod and are very please with the result so I’m documenting this for those who want to be able to control the volume of the drive so that you can balance the volume between clean and with the drive engaged. The added benefit is you can ‘blend’ the drive and the gain and get new tones that simply were not possible before. Essentially this mod turns the Lonestar into a 3 channels amp. I suggest that you get the schematic and look at the pre-amp layout so you can follow the description below. The logic. Insert a pot at the output of the drive circuit. Looking at the schematic, you see that the drive circuit is inserted between the 1st gain stage (V1B) and the 2nd gain stage (V2). It’s actually using triode 1 of V1. The tube chart also tells you this. The output of this circuit is pin1 of V1 and it’s connected to a relay that does the switching when you engage the drive switch. Step1. To see if you'll like the result without any alteration. Using alligator or any kind of clip/wire and connect V1 p1 to the wiper (middle leg) of a pot. Here you can use a 1M log pot. I use a 500k log pot as I like its taper better than the 1M. Connect one (not both) of the outside leg of the pot to ground. With the pot at 0 ohm you’ll get the full cut (no sound), and with the pot at max the pot is bypassed and you’ll get full volume. With the pot around 50K ohm you’ll get a balanced volume with the clean if you set the drive at 12’oclock. Adjust the vol pot any way you prefer. Technically you are using the pot as a variable resistor to send some signal to ground. Play around the drive and gain pots and you’ll see what I mean by ‘blending’ the tone. In general the gain gets warmer and the drive gets brighter as you turn them up. That’s all there is to it. 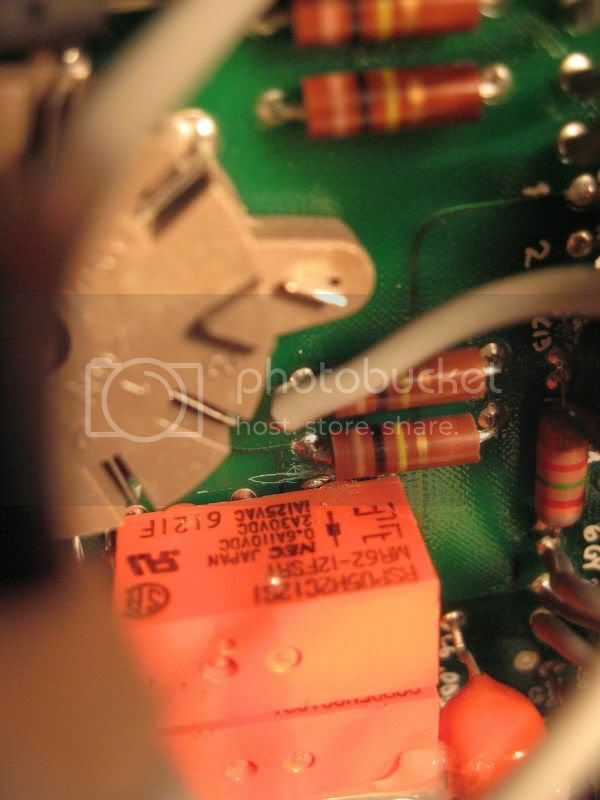 But since there is no coupling capacitor at the output of V1, you’ll get scratching noise as you turn the pot (there is no noise when the pot is not being adjusted). If you like the result and you’re the set and forget kind then you can solder in the wire/pot and stop here. If you’re annoyed by the scratching noise and would likely be tweaking the volume all the time then the next section is the real mod. The logic. 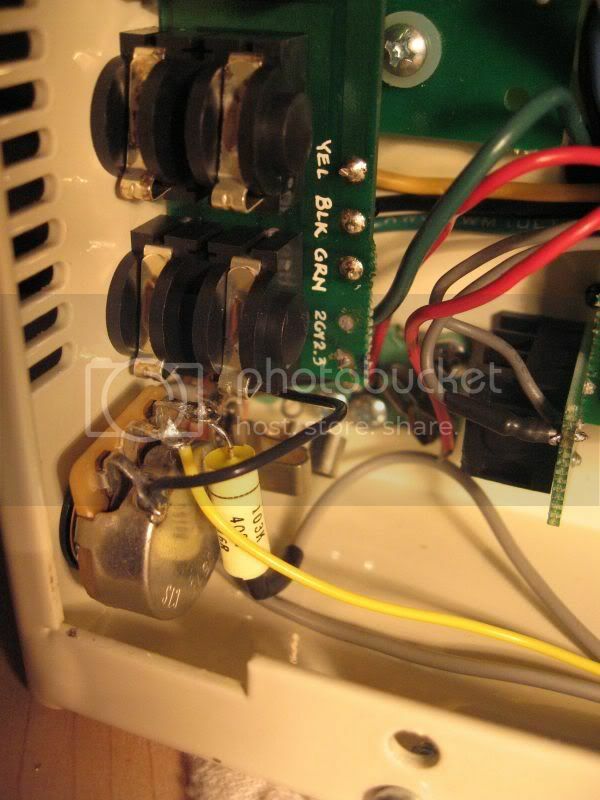 Most amps I’ve worked on have a coupling capacitor after the tube output but the LoneStar doesn’t. So to insert a coupling cap and the pot, the path connecting V1 Pin1 to the relay has to be cut. Looking at the trace on the PCB you can see that V1 pin1 connects to a 100k resistor and then to an orange rectangular box. This orange box is the relay. I cut the trace between the resistor and the relay. Connect a wire to V1 Pin1 (reference here as Vin) and another wire (Vout) to the leg of the relay (where the trace was cut). Connect one of the outside legs of the pot to ground and connect a cap to the other outside leg of the pot. Connect one other end of the cap to Vin and connect the pot wiper to Vout. The value and type of cap is of important since it has effect on the tone. You can try from .1uF to .01uF. The lower the value the more bass will be filtered out. I ended up using a .01uF Sozos cap as I prefer just the mid to high and don’t want that muddy low for my drive. Installation: Since I’m certain that I’ll not use the slave out, I disconnected the slave pot and its jack. I use a Switchcraft jack and a CTS 500M log pot. I connected the drive switch to the jack. For me it’s easier to solder a wire to the relay pin at the back of the board, by going through the tube access hole. Re: Lonestar Channel 2 Drive Volume Mod. Wow! Gonna have to digest this. You're a regular Macgyver. Nothing to add...I just wanted to make sure everyone got a chance to read this. Although I haven't done the mod...it is a valuable inclusion for those who wish to be able to both 'click-in' the 'drive' at will AND 'dial-it-in' to taste. A couple pictures of the mod. V1 pin 1 and the the drive relay. To try out Step 1, you can simply clip a wire to where the gray wire is, this is the output of the drive channel. Wow, cool. I might give this a try at some point. Right now I'm pretty happy, but this could come in really handy. Thanks for posting! Would i be able to use the existing pot? Love the idea of this this mod! WOW thanks for this mod, is this the same for the LSS? IMHO, the Step 1 mode is quite dangerous. 1. Pin 1 on V1A which has at least 202V DC voltage, if you connect it directly with a pot and shunt it to the ground directly, the current will possibly damage the pot if you didn't take the pot wattage into consideration. 2. On Lonestar, they do have the coupling caps, they are 5 caps before EQ circuit. What you are doing is to insert a shunt pot in between V1A and EQ circuit. I think it is better to go directly with Step 2 in your mod since there's no coupling cap in Step 1.